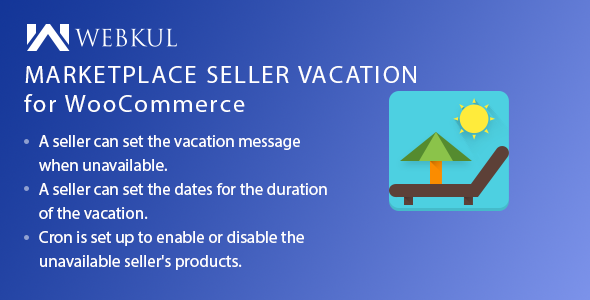 Marketplace Seller Vacation for WooCommerce allows the seller to display an unavailability message if the seller is unavailable or if a seller wants to keep his shop closed temporarily. The seller can close the shop for the desired period of time and the users will get to know that the seller is not available through a message that will display against the seller’s products. A seller can set the vacation message when unavailable. A seller can set the dates for the duration of the unavailability or vacation. A seller can set product status as enable or disable to display or disable products from the product page during unavailability. A seller can set the vacation status as on or off to show the availability or unavailability. Admin can choose “product disable” to disable the products of the unavailable seller. Admin can choose “add to cart disable” to disable the products of the unavailable seller. Admin can setup cron to automatically enable or disable the unavailable seller’s products. Admin can view the seller’s name, vacation message, product status in the admin panel. Fully open source and can be customized as needed.